Post by Chip Nolan, OrcaCon’s Volunteer Director. It’s that time of year, when Merchant and panel submissions are closed, game submissions are underway, and we start really ramping up our planning for the next OrcaCon. This is the perfect time to offer everyone the opportunity to join the team and become a member of team OrcaPod! At OrcaCon, we believe the spirit of the show – and that feeling of welcome and warmth – stems from our team of wonderful volunteers. Our volunteers not only cover the logistical needs of OrcaCon, but they do so with a focus on accessibility and inclusion. We ask each volunteer to participate in an orientation before the show to review our show policies, and to learn how they can help the OrcaCon community have the best time they can have. What sort of tasks do volunteers at OrcaCon do? We have all the necessary, important roles that every convention needs: registration, info desk, the library check-out desk. They help with setting up the show and tearing it down after the weekend is over. On top of those classic roles, we also have a special role called Game Host! What do OrcaCon volunteers get for volunteering? Each volunteer receives a volunteer badge to OrcaCon, and an OrcaCon volunteer T-shirt. 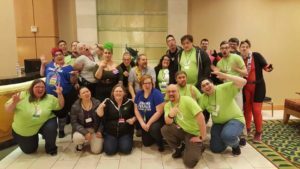 Interested in lending a hand at OrcaCon, and sharing your love of games with the community? You can fill out a volunteer application! New volunteers will learn if they have been accepted in November. Can’t wait to start getting involved with OrcaCon? Be sure to watch our Facebook page to learn when our next planning meeting is taking place. Everyone who is interested in learning more about us or lending a hand is welcome there!